What Exactly is a Subluxation? 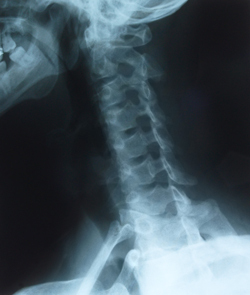 Subluxations occur when vertebrae in the spine are misaligned or move out of place. It goes by different names – Subluxation, Vertebral Subluxation, Vertebral Subluxation Complex or simply Nerve Interference. Whatever you call it, it’s the same thing and chiropractors are the only ones who know how to find it and correct it. Let’s use the term ‘subluxation.’ Subluxations occur when vertebrae in the spine become misaligned or move out of place. When an individual vertebra moves out of its proper position, it can press on the nerves that pass from the spinal column out through the space either above or below it. Because nerves carry messages between your brain and your body at lightning speed (think about how fast you move your hand when you touch something hot), nerve interference caused by a spinal misalignment can cause the body to malfunction. Simply put, subluxations interrupt normal nerve function, causing a breakdown in the body’s communication center, the central nervous system. Physical causes, such as a car accident, a slip or fall, a sports injury, repetitive movements, such as lifting all day on a job, improper sleeping positions, inadequate sleep and bad posture. Emotional causes, such as grief over the death of a loved one, anger and other negative emotions that cause too much stress in your body and result in damage to your body’s immune system. Chemical causes, that result from improper nutrition (fast food), smoking, alcohol and substance abuse and toxins in your external environment, food and water. Chiropractors receive special training to adjust the spine, which moves the misplaced vertebrae back into their proper position. It may take time for your body to “hold” an adjustment and for the vertebrae and the surrounding muscles, ligaments and tissue to recognize the new position as being “normal.” However, once the subluxation is corrected, the nervous system becomes fully functional again, allowing your body to heal. The biggest problem with subluxations is the fact that you often don’t even know that you have one until you experience symptoms, such as pain or a breakdown in the functioning of a major organ, and then it might be too late. Receiving regular chiropractic adjustments keeps your nervous system in prime working order, much the same as receiving regular dental care keeps your teeth and gums healthy. If you have any questions about subluxations or the effects that they can have on your health, please be sure to ask us at your next visit.